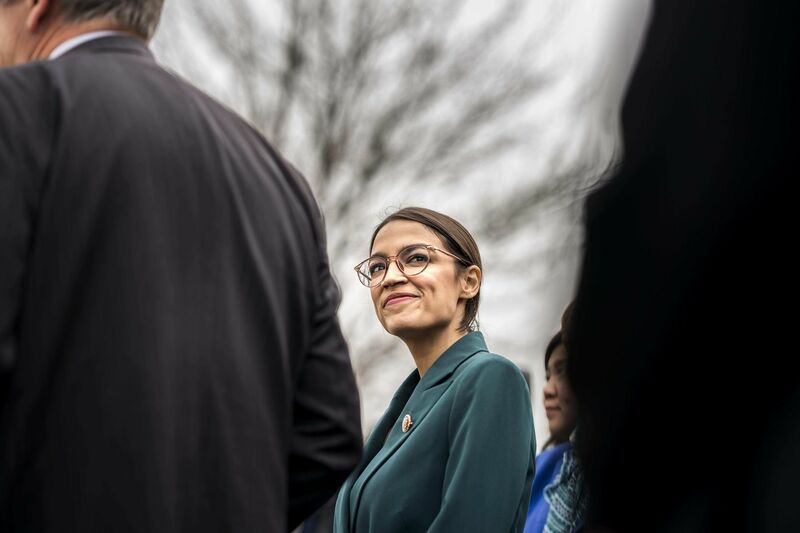 Rep. Alexandria Ocasio-Cortez, D-N.Y., attends a news conference introducing a Green New Deal resolution in Washington in February. The American public strongly disagrees. Indeed, an overwhelming majority believe that aid should be denied to those who are unwilling to help themselves. More than 90 percent of Americans believe that able-bodied adults who receive cash, food, housing, or medical assistance should be required to work or prepare for jobs in exchange for those government benefits. Of these more than 90 programs, only four — TANF, food stamps, the Earned Income Tax Credit (EITC), and the Additional Child Tax Credit — have work requirements. And, even in those programs, the requirements are riddled with gaping exemptions and loopholes. The need for reform is obvious. That’s what led Sen. Steve Daines (R., Mont.) and Rep. Kevin Brady (R., Texas) to introduce the Jobs and Opportunity with Benefits and Services (JOBS) for Success Act (H.R. 1753). It advances this principle of providing aid only to those who are willing to take steps to help themselves. It would greatly strengthen work requirements in the Temporary Assistance for Needy Families (TANF) program. The bill requires universal engagement: All able-bodied recipients receiving taxpayer-funded aid would be required to work or to prepare for work if no job is currently available. This requirement revives the pro-work foundation of the original TANF program, which was signed into law by Bill Clinton in 1996. A core component of welfare reform in the 1990s, TANF replaced the failed Aid to Families with Dependent Children (AFDC) program. And it worked, producing dramatic reductions in poverty and dependence. Welfare rolls dropped by 50 percent, and poverty rates for children, especially black children, fell to record lows. Before welfare reform, about one in seven children in the U.S. received payments from Aid to Families with Dependent Children; today, fewer than one in 20 children rely on TANF. Moreover, the poverty rate among single-parent families (which formed nine-tenths of the AFDC caseload) was cut in half after welfare reform, dropping from 30 percent in 1996 to 15 percent in 2017. In recent years, however, TANF has faltered. The reason for this failure is clear. Although TANF is supposed to be a work-based program, the law allows half of TANF’s work-capable adult recipients to remain completely idle and still receive benefits. The JOBS for Success Act would end that. Those who oppose the bill — and work-based welfare in general — argue that it is unfair to deny benefits to people who cannot find jobs. But that’s not what the reform would do. Following the original TANF principles, recipients who can’t find work would still receive benefits, provided they participate in one of various mandatory activities designed to improve future self-support. These constructive activities include on-the-job training, vocational education, job-skills training directly related to employment, community-service work, or supervised job search. Recipients under age 20 may also pursue a high school or general education development (GED) degree; those 20 and over may pursue those degrees if study is combined with other listed activities. This type of work-oriented welfare reform benefits both taxpayers and recipients. It goes a long way toward connecting these adults to work, which is an important component of human well-being and flourishing. For example, in most states a single mother with two children who receives welfare but does not work will receive benefits with a combined annual value of about $22,500. (This sum includes TANF, food stamps, child nutrition, and Medicaid.) But, if that same mother worked full-time through the year, even at federal minimum wage, her combined income from work and welfare benefits would total around $36,500 — well above the poverty level. (This sum includes post-tax earnings, the earned income tax credit, the additional child tax credit, food stamps, child nutrition and Medicaid.) Overall, idle welfare dependence promotes poverty, while work requirements and employment sharply reduce it. Despite nearly universal public support, serious work requirements remain a rarity within the welfare system. A broad overhaul of the current permissive system is badly needed — not just in TANF, but in food stamps, the EITC and housing programs as well. A leading authority on poverty and welfare programs, Robert Rector is a senior research fellow in the Heritage Foundation’s Institute for Family, Community, and Opportunity. He was a key architect of the 1996 welfare reforms.